In previous entries, we’ve covered how cannabis might affect memory and memory consolidation. The basic idea has been that cannabis might prevent the formation of traumatic memory. However, until now, we haven’t seen any research dealing specifically with fear. 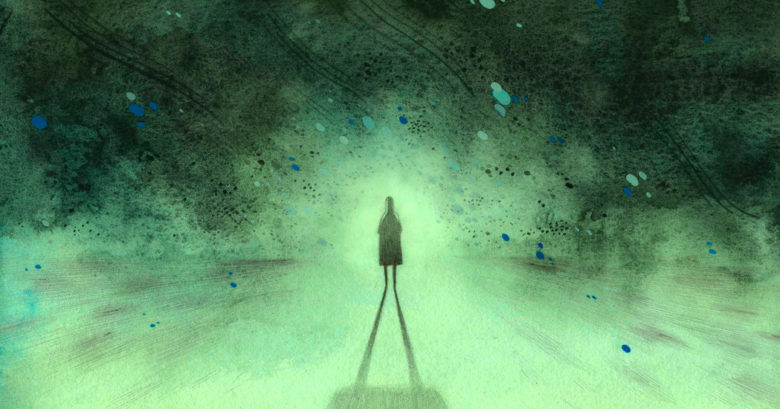 The connection between memory and fear may not be immediately obvious to readers; however, as it turns out, they’re very much related. A state of fear engages previous memories of threat as well as requires recall of escape/defense strategy. Given cannabidiol’s (CBD’s) success in early studies as an anti-psychotic, researchers might hypothesize a beneficial effect of CBD administration on fear response. However, only recently have Brazilian researchers carried out such an experiment, using rodents and varying doses of CBD. In most animal models of fear, researchers apply a threatening environmental stimulus. Of course, none of these might be more threatening than the mice’ natural predator, a boa constrictor snake! Researchers therefore forced confrontations between mice and snakes using an “arena” or plastic container, where they could record movement information. In one corner of the container, researchers placed a protective burrow. This burrow has two sides and a small opening on either, allowing mice to run in one side to escape the snake, and run out the other side once the snake begins to enter the burrow. Because this is an effective escape, a pro-survival strategy of mice would be to run away from the snake, toward the burrow. This is called “oriented escape”. However, in some cases, the mice become too scared and simply run as fast as they can away from the snake, regardless of direction. This is called “explosive escape”. Mice may also become immobile defensively while scanning the air for signs of a perceived predator. Three days before the experiment, researchers began by placing mice in the “arena” with free access to food and water. On the day of the experiment, researchers removed one group of mice to serve as the “no snake” control, then injected the remaining mice in four groups with varying levels of CBD (0.3, 3, 30 mg CBD per kg of body weight, and finally just vehicle (no CBD)). Afterwards, researchers added a constrictor snake to the center of the cage and placed the mice at the corner opposite the burrow one by one, effectively placing the snake between the rodent and safety, forcing confrontation. No rodent was tested more than once. From here, researchers tallied and scored mice’ physical reactions. For instance, Defense Attention of rodents is defined as six seconds looking away from primary task to defensively scan the environment. Active Avoidance Behavior, on the other hand, is defined as a time in which the rodent headed toward the snake, then stopped to change directions and avoid confrontation. Researchers also tallied non-defensive behavior, such as crossings, grooming, and rearing on hind-legs. All in all, this gave scientists an understanding of rodents fear as expressed by their physical actions in a relatively small environment. As would be expected, the mice that were not exposed to the snake showed no real fear behaviors (they showed only a minor reaction to their food supply being moved). However, as the graph below shows, mice outside of the burrow showed an increase in non-threatened defense behaviors correlating to an increasing dose of CBD. These behaviors, such as Defensive Attention and Risk Assessment (using lower half of body to enter an area, rather than head) spiked. However this spike occured at the lowest dose of CBD, 0.3 mg/kg of body weight, before seeming to trail off with greater doses. Of course while non-threatened defensive behavior increased, panic behaviors dropped dramatically along with increase in dose of CBD. In the graph below we can see that groups receiving 0.3, 3, and 30 mg CBD/kg of body weight always scored a lower behavioral index/duration than just vehicle/placebo with the exception of Oriented Escape (which seemed to increase). How might we interpret this data? 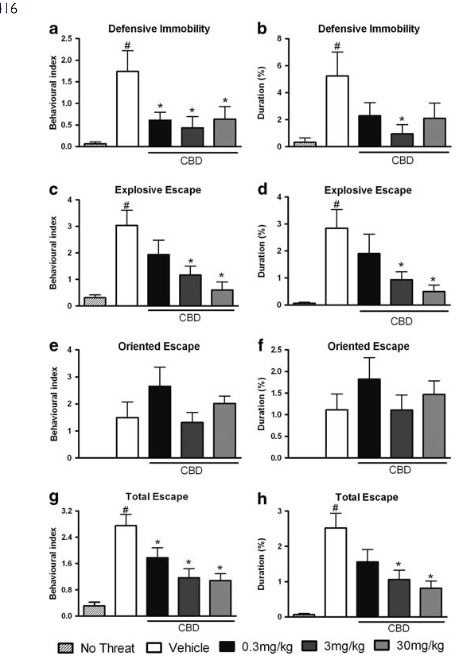 Researchers argue that CBD effectively limits adverse response to fear. If we define adverse response as response that decreases survival of rodents, adverse response would include Explosive Escape (non-oriented escape means the rodent is not necessarily running to a safer place), as well as Active Avoidance, while positive response would be anything to reduce risk, such as Defensive Attention and Risk Assessment. 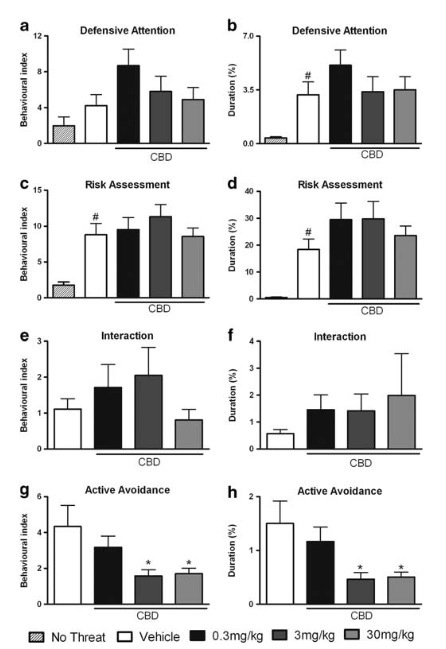 Given these results, CBD does indeed seem to show a vaguely dose-dependent result that selectively decreases adverse response while increasing positive response. How this effect might be occurring, whether it is neurological or physiological, remains in question, although again, researchers speculate the key may involve storage and access of memory. Researchers also point out a recent study that shows CBD can “modulate patterns of …brain activity during the viewing of fearful face stimuli” in humans. It is likely that the entire endocannabinoid system has some tie in to fear processing. This is an important observation, because it could mean the development of an anti-PTSD type drug or more generally a drug that helps attenuate unfounded fear. At the time being, few medicines exist for this application that are not also mood-altering. Fortunately, CBD has no psychoactivity, giving it real promise as a future medicine. Andres Uribe-Marino, Audrey Francisco, Maria Angelica Castiblanco-Urbina, et al. “Anti-Aversive Effects of Cannabidiol on Innate Fear-Induced Behaviors Evoked by an Ethological Model of Panic Attacks Based on a Prey vs the Wild Snake Epicrates cenchria crassus Confrontation Paradigm.” Neuropsychopharmacology (2012) 37:412-421.